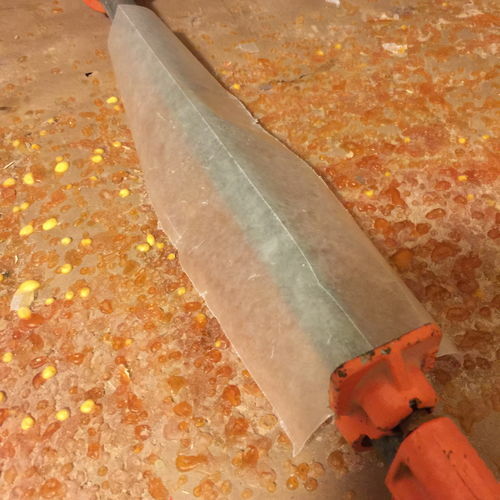 Either way – the rule of the shop with scrap is this and always this: You will have scrap, you will never scrape the bottom of the scrap bin and you will always wonder how the bin got so full so fast. Second reality of scrap is that no matter how much scrap you have you’ll almost never find that one piece that will fit the project at hand. Hence the “absolute need” to go to the lumberyard to buy more lumber. Third fact – you just have to live with it and learn to accept it as a fact of life in the woodshop. The really good news is there are ways to manage it. 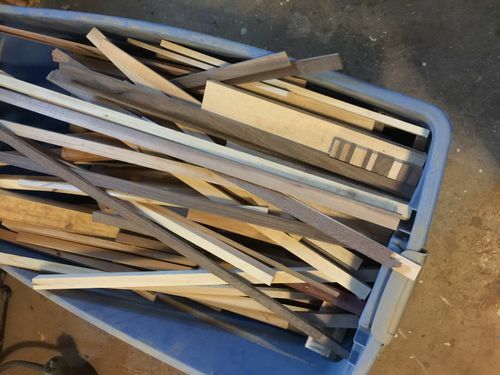 For me the number one way is use the scrap for my face grain boards and/or to use it up in the infamous chaos boards that are so popular these days. I have several rules with the scrap bin. 1. I don’t put in the really ratty pieces that have knots; splits, or other major defects. I cut out those defects before the board hits the bin. 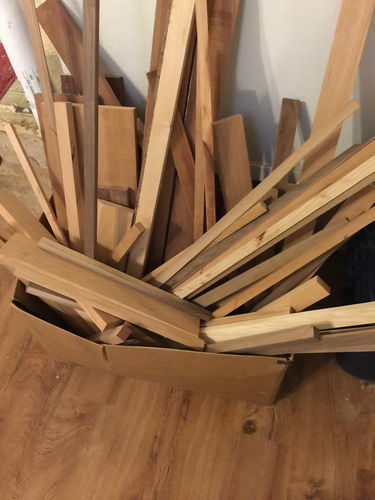 This means that the only wood in my bin is usable pieces. 2. I try to only put in pieces with both edges clean. This is a rule that I, unfortunately, break on a regular basis. When the bin is fresh I start off really well but as time goes by this rule is broken. 3. 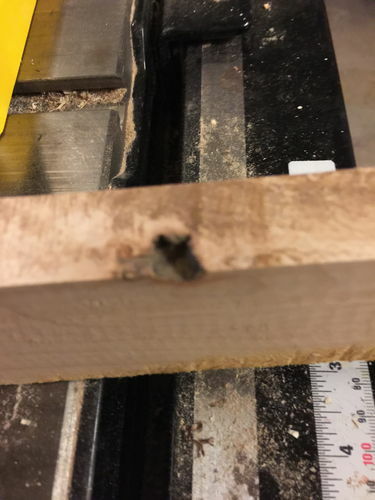 If a piece is too thin to be put through the planer and it’s not clear on both sides, I toss it. To manage the scrap pile you really have to be brutal on what you will keep and not keep. Otherwise you’ll be overrun. There’s quite a lot in these two boxes – which is good for me. 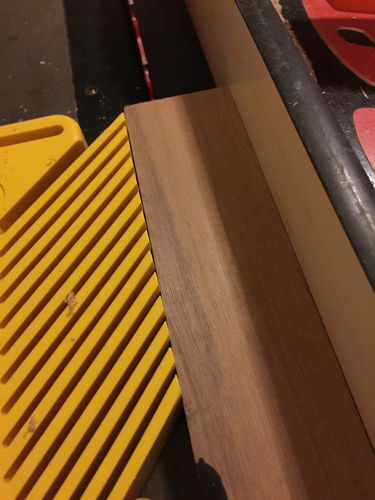 I need to make quite a few face grain boards so I’ll get a lot out of these two boxes. Despite my rules I do have some boards to clean up. 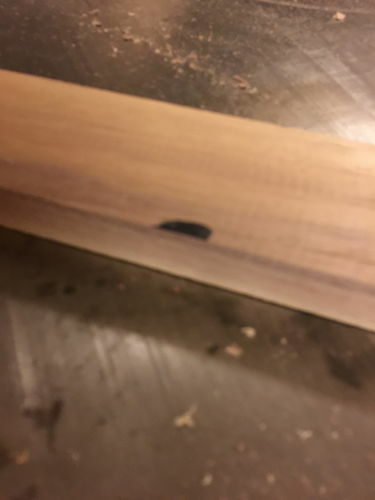 This particular one has two issues, a small knot and an edge that is not acceptable for gluing. The next pictures are from a different board as I managed to delete the pictures of my steps – no idea how – but there it is. So try to pretend that the following is the same as the piece above. 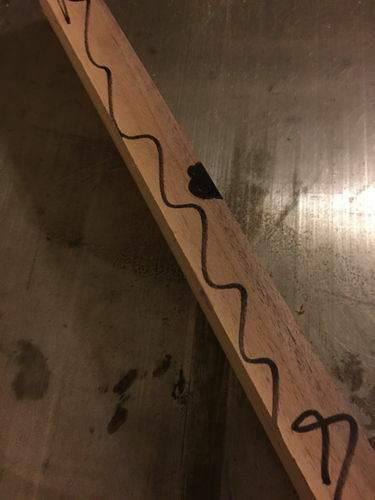 You can see that my knot is also on an “unclean edge.” I could simply place the board such that I cut the board right at the knot and not worry about the edge. 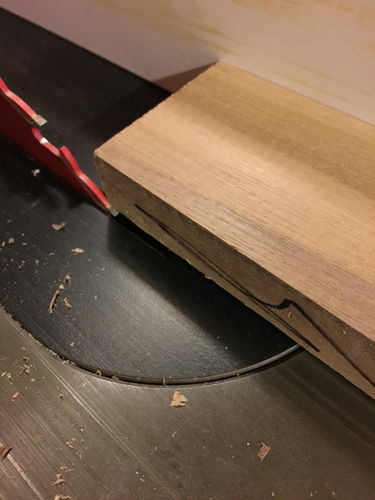 But if I take ten seconds and clean up the edge first then after I slice the knot out I can then cut the knot out of the ¼” portion of the original board and have yet another piece of scrap to use for another project. How wonderful is that! The next picture shows a common issue that I used to say “so what” about. It didn’t take long to realize that some of my bad joints were the result of the fact that I let things like this slide. You can see in the picture that dark mark. That’s a burn but when is almost impossible to see is that there is a crescent mark that resulted from poor cutting on my part. This type of burning or mark needs to be taken off of the board. I’ve always understood that a burn on a board essentially seals the fibers of the board and can impede a good glue joint leading to a failure. I can’t say that I have a good source to back that statement up, but it makes sense to me. The crescent will create a small gap in the joint. Either issue is easily taken care of. Set your blade so that it barely kisses the board, set the featherboard to hold the piece hard to the fence and push it through. This seems pretty simple – but don’t use old, tacky or “doesn’t look right” glue. My rule is that if glue has been around a year or more; or it’s been frozen or heated – just get rid of it. Believe it or not glue does have a shelf life and can go bad. There is, of course, opinions on this issue. Some say as long as the glue flows easily it should be okay, others say that it starts to degrade over time. I use about two gallons of glue a selling season on my boards so I don’t have the time issue. However, because I live in Texas, I am careful to keep the glue stored in the house and not in the uncooled garage. Long and short, if it’s old, flows like oatmeal or looks odd – toss it out and get a new bottle. Squeeze out – now here is a spot that you’ll get arguments to rival politics. 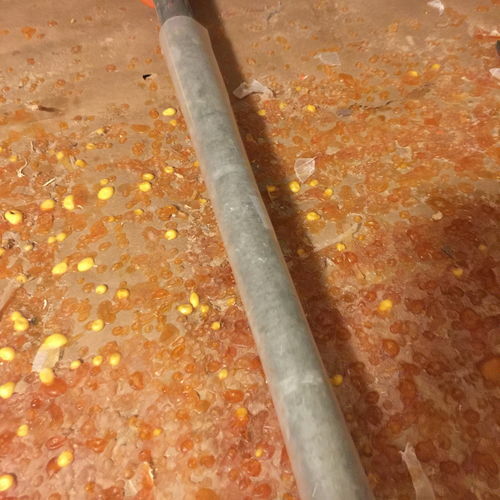 Do you clean up squeeze out as soon as you’re done clamping, do you use a wet rag, do you wait until the glue hardens then scrape like mad with a paint scraper, do you let the glue skim over then scrape with a putty knife, do you let it dry then run it through the planer? Lots of opinions. 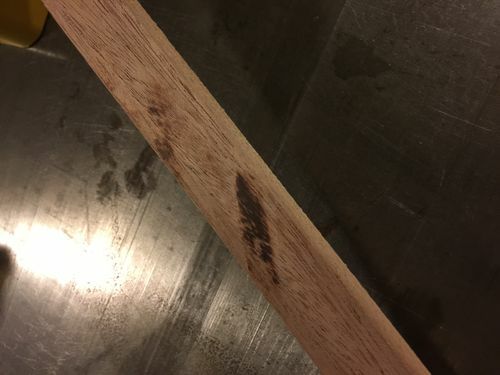 This is, in my humble opinion, more of an issue and a more important one, when you are talking about projects involving stain – such as furniture. However, because we are talking cutting boards that will not be stained – I think the dynamics are different. The problem with the tent is three-fold. One you have to use enough paper to cover the pipe and reach the tabletop. Secondly, it moves! I got frustrated with this method because as I would move my wood to glue or reposition it the paper would move. Third, and finally, because it may move, it can get bunched up and can get in between my work pieces causing more problems than I care to mention. So I skip this method and use much less wax paper by simply taping it in place with a little sliver of scotch tape. The paper doesn’t move and it’s easily removed when the clamps come off. Now, despite using paper and/or painter’s tape, I still get glue on the pipes. I’m the type of person that can get dirty doing the laundry so not being about to keep the glue completely off of my pipes is not a stretch for me. So here’s your bonus tip. Every 5 or 6 months I’ll sort through my clamps and will set about cleaning up any dried on glue. On regular pipe clamps the glue will sometimes just pop off with a good push of a putty knife. Doesn’t happen often enough for me. I end up using good old vinegar to clean up the clamps. All I do is soak some paper towels and wrap the pipe. Let it sit for an hour or so, remove the towels and wipe off the glue. The vinegar stinks so I usually do this outside on a nice sunny day. Okay that’s all I’ve got today. The next entry I’ll try to hit up some “opps how do you fix this” tips. Great tips here, Betsy! Thanks for the one about vinegar and the clamps. I’m going to need it after this batch of rolling pins. Hmmm, wax paper you say? Might try that. I generally use the blue painters tape. 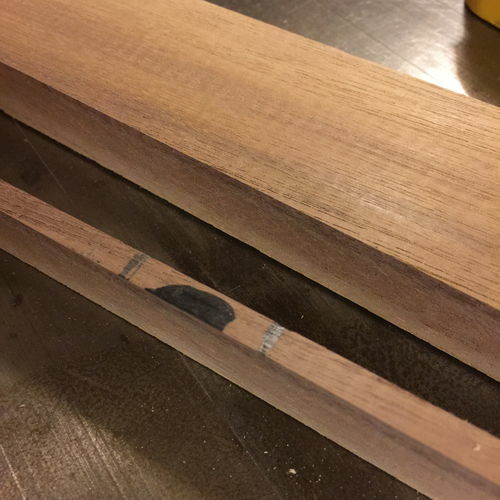 And I also learned to leave a gap at either end of the pipe so the tape doesn’t get jammed up on the clamping ends. Thanks for the great posting! I don’t have an actual rule about scraps. I am just one of those people who has a hard time throwing things away. I tend to think ” I might be able to use that someday”. I always go to the scrap bin when I need a clamping caul, so I even save some little pieces that I know won’t go into a future project for that purpose. I think Lew and I are pretty much on the same page with this one! Excellent post and I loved the scrap rules/laws at the beginning. So true ! Thanks guys. I enjoy doing the blog. Makes me think a bit. Hope it helps some. Betsy, I just stumbled in. Had to go back and read the whole blog series. Thanks for all the detailed info. Not too much, not too little. Very useful stuff. Much of the info translates into “general use” woodworking info, also. Thanks again and keep up the good work.